The portal design, or skins, are known in Jetspeed as decorators. With decorators, you can customize the portal experience to the branding of your organization. 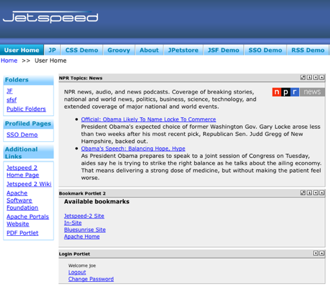 Each Jetspeed page can be associated with a different page decoration. That said, it is recommended that you set page decorations at the folder, even root folder level. The colors, images, CSS styles that skin the page. The meta information of a page such as title. The branding of the page, corporate images, colors. Each Jetspeed portlet window on a page can be associated with a different portlet decoration. The colors, images, CSS styles that skin this window. The title portion of the portlet. The borders of the window. In the upper right hand corner of the Jetspeed Portal Window, you will see a Logout link followed by two icons. the first icon is the edit icon, which in this case is our means to access the customization options for the entire portal window. Click on the pencil (edit) icon and you should now see a page similar to the one below. The Page/Folder Customizer section has three options for us to configure. Theme will set the decorator for the portal window's tabs, menu and window itself. Layout will allow us to change the amount of columns in our Jetspeed window. The portlet theme is a global setting for all portlets contained in the portal window. This global setting can be overridden by individual portlets within the window. If you do not set the individual portlet decorators they will inherit the Portlet Theme from this section. Tigris is the default decorator for a standard jetspeed installation. Notice the Theme drop down menu does not require pushing a change button to make your selection become active. Once you choose an option from the dropdown menu, Jetspeed will render the window with your choice. Only the Layout was affected, not the portlets window. 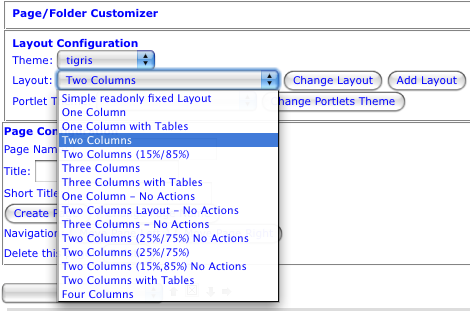 Layout allows you to choose multiple column layouts or a single column for the entire window. 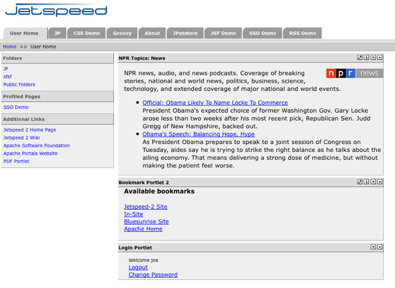 Jetspeed will remember the locations of portlets when altering this layout. Changing the Layout to put all the portlets into four columns and changing back to two columns will return the portlets back to their original columns. Add Layout will insert layout options within the window with the portlet. This allows you to setup multiple columns within one column. Clicking on add layout added a new Page/Customizer option below the Bookmark Portlet 2 from our previous example. 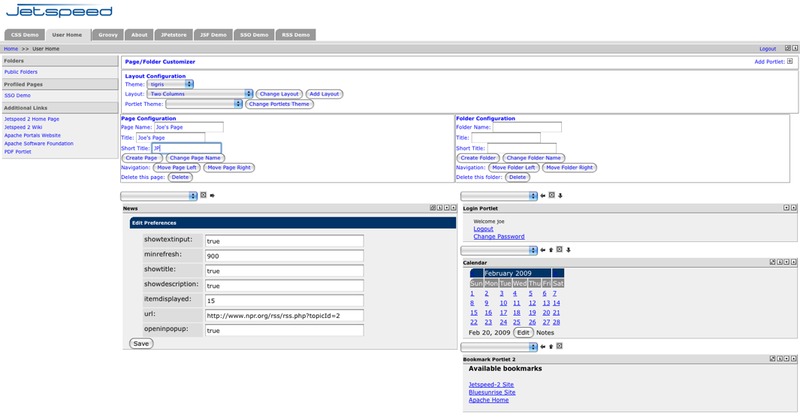 The user can now customize this new layout within the layout using the options provided. You will also notice arrow icons and an X icon. These will be discussed in the Portlets section of Customizing but they are for moving and removing portlets. Portlet Theme will set the decorator for all the portlets in the window. If you have set individual decorators on your portlets, this will reset all portlets in the window to the Portlet Theme you have chosen. 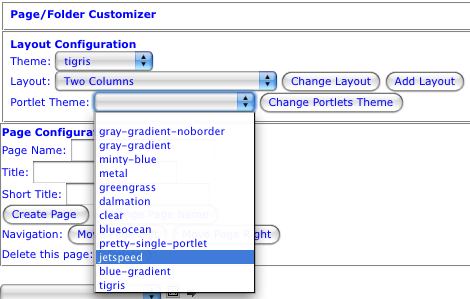 You must reset individual portlets after choosing this option if you wish them to have a different decorator. To have Layout and Portlets all using the same theme, you must set them to the same decorator.